Spray 3 1/2- to 4-quart oval slow cooker with cooking spray. Unroll pizza dough; fold in half crosswise. 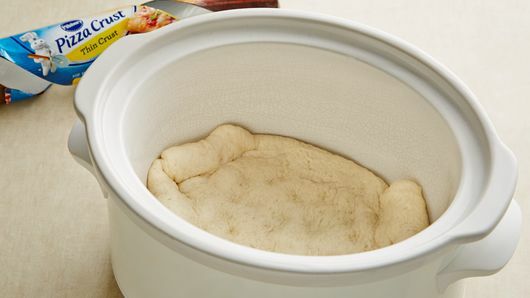 Place pizza dough in slow cooker; press in bottom and 1 inch up sides. Spread pizza sauce evenly over pizza dough. Top with half each of the sausage, pepperoni and cheese. Repeat with remaining sausage, pepperoni and cheese. Cover; cook on Low heat setting 1 1/2 to 2 hours or until crust edges are deep golden brown and cheese is melted. Remove from slow cooker to cutting board. Cut and serve. 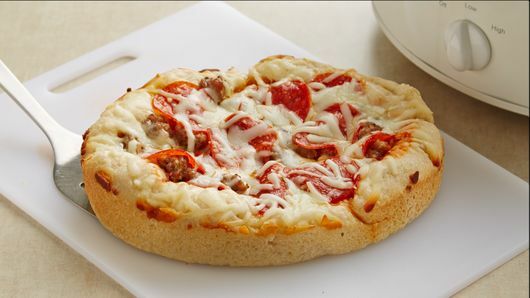 Experiment with this easy slow-cooker pizza with any of your favorite pizza toppings. A 3 1/2- to 4-quart round slow cooker can be used instead of the oval. Fold pizza dough in half crosswise; press in bottom and 2 inches up sides. There’s no need to plan a trip to Chicago for deep-dish! This pizza can be made at home, and even better, can be made in your slow cooker. You can easily substitute in your favorite pizza toppings and customize your deep dish with your own preferences, like spinach and sun-dried tomatoes. 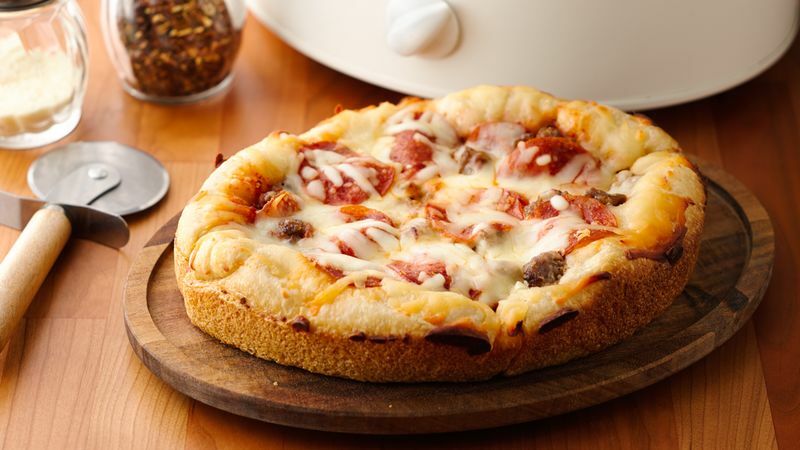 Traditional deep-dish pizza is made with a deep layer of dough, which forms a bowl for the ingredients when cooked in a high-sided pan, and a signature sauce layer on the top. 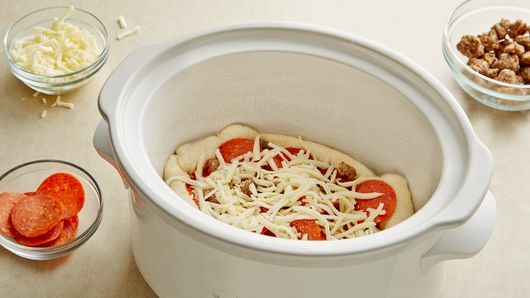 The slow cooker allows for a low-maintenance meal—you can pop in the pizza and spend more time with your family while it bakes. For more low-stress creations, browse all of our pizza recipes.